Language International is a booking agency for language courses. Students can quickly compare 1000s of courses in 122 cities around the world based on prices, locations and classes. Friendly student advisors will help students find the right school for their needs. We only work with accredited language schools. Our services are free to use with low prices guaranteed. Language courses in Europe, in Spanish, French, German, Italian. Find how you can earn college credits while you learn Italian, Spanish, French, German and experience life in another part of the world. AGS design and deliver customized programs for individuals or groups who wants to learn Spanish. The course focus on the personal and professional needs of each student offering a variety of specialized programs including: Spanish immersion, Medical Spanish, preparation for the D.E.L.E exam, Spanish and culture. among others. The Italian language school Centro Studi Italiani offers Italian group courses and individual lessons for all levels in the historic town of Urbania in the Italian Marche region. Language students can also attend special courses for opera singers or preparation courses for Italian universities; it is also possible to take the internationally recognized CELI exam. Spanish Courses in Buenos Aires, Cordoba, Mendoza, Bariloche, Ushuaia and Santiago de Chile. Internship and volunteer placements. We are a small company created by a group of people who thought there had to be a better way to learn languages. Almost from the very beginning we realized that most language learning methods don't work for a few reasons. They lack common sense. They're obsessed with either small grammar issues or use gimmicks to avoid grammar altogether. And like most e-learning, they're incredibly boring. Tandem Munich offers German courses, leisure programme, accommodation service, mini-groups and individual training. inlingua Malta has been providing quality language training to people from all over the world since 1980. We are part of inlingua International, the largest association of privately owned language schools in the world currently having 350 centres in 44 different countries. inlingua Malta is an authorised centre for the Cambridge ESOL exams. Students who take an exam preparation course can sit for the Cambridge Exam within our premises. Join our Spanish courses in 5 different cities in Spain. Low cost programs. The Italian language school Istituto Venezia is officially recognized by the Italian Ministry of Education and has been promoting and supporting the Italian language for many years in Venice and Triest. Apart from group courses with different intensity and for all levels, the Istituto Venezia is also offering individual lessons, combined courses as well as courses in history of arts and Italian cooking courses. After the lessons students can take part in the diverse sparetime activities organized by the school team. 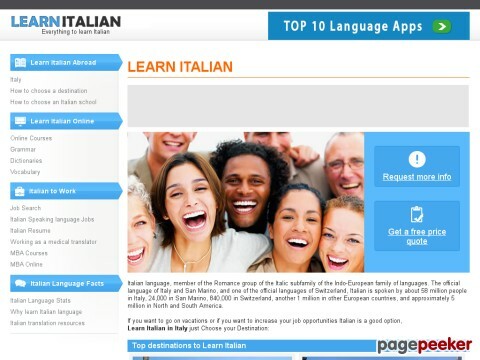 Italian language courses in Florence, Lucca, Cortona, Elba Island and Bologna. Learn Spanish: Spanish language schools offering spanish courses in Spain & Mexico.